#783: How do I tell my dysfunctional folks I’m not spending the holidays with them this year? They’re playing Christmas music in the Walgreen’s near my house, so, here you go. I need a script for my dad for the upcoming holidays on why I am not spending it with him, and I need a script for my in-laws on why I am likely to be pretty emotional while I try out spending it with them. Both my parents are alcoholics and my mother is abusive. I stopped going “home” (300mi away) for the holidays at 20 after a physical altercation with my mother on Christmas Eve the previous year. My mother is ill; I spent my teens caring for her, as well as serving as my dad’s only emotional crutch for her abuse (which was worse toward him) while he drank, making him unavailable to me. Among the features of her abuse was to habitually threaten suicide and dramatically self-harm, primarily as manipulation tactic, whenever someone did something she didn’t like. As their only child I have found those codependent bonds extremely difficult to break. After hashing it out with a therapist I found the thing that was least taxing for me was still to visit, but to put firm boundaries on those visits. Accordingly we have done a strictly sober “Christmas” a week early, which largely avoids the worst of the manipulative nonsense from my mom, and I have spent the holidays themselves blissfully alone for the last five years. I am now 26 and this year I moved 3,000mi away, which makes travel times more difficult to arrange. I have to go back to my home state to wrap up my graduate degree at the end of December. I do not want to spend the holiday with my parents for obvious reasons. My dad (now sober for five years) is aging and is struggling to remember some of the features of my childhood, and he and my mother have both denied my abuse before, so I do not want to cite that as my reason for not going in case it raises that conversation. He doesn’t have much in his life and I don’t know how to tell him I’m not coming without turning the interaction very negative and conflict-oriented, because I think we both deserve better than that. On the flip side, I have an incredible, loving boyfriend. His family loves me and I them, and they are *all about Christmas*. I feel great joy and great sorrow when I think about spending the holidays with them. After talking very frankly with my boyfriend about my conflicted feelings, we agreed that I could try to spend the holiday with his family, and I can always bail if I’m not feeling it. He is very supportive of this plan and of whatever I may need, but I feel unsure how to present my potential for ill-timed breakdowns and need for escape plans to his family, who, bless them, could be the default photo in picture frames for how ignorant to struggle they seem to be. What’s the best way to say “the holidays are triggering for me” to both these parties without saying those actual words? Let them intuit the reasons. And let their reactions be theirs. Him: “I can’t believe you don’t want to spend Christmas with your old man!” You: “Sorry dad, not this year, but I hope you and Mum have a nice day.” + HANG UP PHONE. Since you’re going back to town anyway, go ahead and have sober holiday (observed) on another day if you want to or don’t if you don’t want to. Take your dad out for breakfast or some other small event if you want to see him (or don’t, if you don’t want to). His memory was selective to begin with and will only fade as he gets older and that’s a hard thing for an abused kid to carry into adulthood, that knowledge that parents can just forget the things they did to you and that that resolution and real honest discussion is probably never coming. When the monsters of your childhood become faded old people with the fight gone out of them, what do you do? How do you find a way to relate? Do you forgive and try to find a way to interact with who they are now or do you hold onto the tight little ball of yourself you’ve been protecting all this time? I think maybe you take it day by day, year by year. This year, you could send them a nice holiday card (and think about sending them the info about your travel in a card or an email) and remind yourself that it’s not a negotiation. This is for everyone reading: You can spend holidays with whomever you like, including just yourself, if that’s how you want to roll. Family members will have feelings about it, and that’s understandable, but their feelings don’t automatically trump your own. The first time you break tradition is the hardest time, but people do adjust. Letter Writer, for your boyfriend’s family visit, I suggest that you do your best when you’re there, and if you need to bail, you let your boyfriend smooth it over and explain. If set-up needs to happen, he can do that, too. “You are all so great, but this is LW’s first holiday away from her family and it’s hard for her. She just needs a little space for a bit.” You could also plan time during the visit that is just for you or just for you and boyfriend so that you have some quiet built-in. Or go for one or 2 days, not a multi-day extravaganza, and spend the rest of the time alone. When you’re there, volunteer to run lots of errands at the store, for example, or have your boyfriend take you to see That One Cool Thing In His Town. Be the person who goes to bed really early. Nobody has to know that “bed” is “you quietly reading a book in bed.” Let yourself be a guest, take care of yourself, bring a nice host-gift for his folks to observe the ancient rituals, and let your boyfriend take care of you. Let his care include smoothing over anything that might need smoothing over. Whatever answer is your answer is good enough, and your holiday celebration (or “just another Thursday”) is good enough, and you are good enough, and there are a lot of people out in Awkwardland who feel you and get you and root for you and love you. This year we’re going to have Thanksgiving and Christmas (and other winter holidays that you can nominate in comments) Open Threads on the actual days for people who need a place to vent and collectively off-gas some winter feelings. ❤ ❤ and <3. 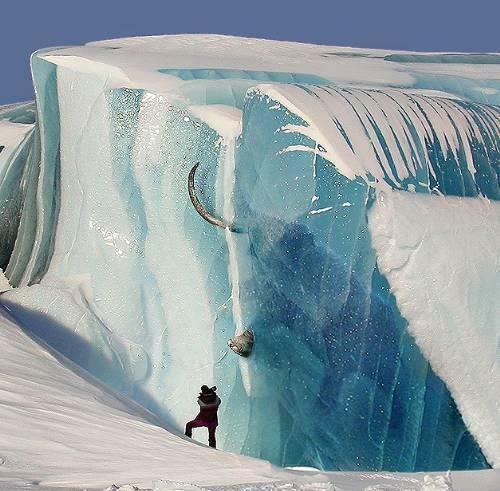 Sometimes the elephant in the room is really cold. I was hoping for some advice on dealing with my sister-in-law. Who hates me. She’s a bit rude/rough around the edges most of the time, to most people, that I’ve seen – but she is really not a fan of mine. She doesn’t return simple greetings “Hi, SIL, how are you?” and looks right through me if I happen to be in the same room as her. I don’t want to sound like I’m All That, but I get along well with the rest of the family – lots of cousins, aunts, uncles, etc. – this is all her. Other family members have noticed and mentioned (to me) her chilliness toward me over the 10+ years we’ve known each other. I have no idea if it was something I said or did – and if it was I’m sure I would apologize for it! She’s never said. She and her brother (my husband) aren’t close at all, it could be auto-antipathy because they don’t get along? I don’t know. And – here’s the awkward part? Although we have a lot in common, and it would be nice if we could be friendly, I have no real interest in talking to her, or in overcoming the barriers, tearing down the wall, or whatever. I’d really just like some ideas for coping strategies for being flat-out ignored when I’m sitting there making conversation or having dinner with a group of people, one of whom refuses to acknowledge my existence on the planet, let alone in the room. Any thoughts on how to deal with her as the future aunt of any possible spawn would be great, too. Happy Christmas to all who celebrate! I’ll be spending the holiday with friends and The Doctor. I’m promised a gay men’s choir somewhere in there. 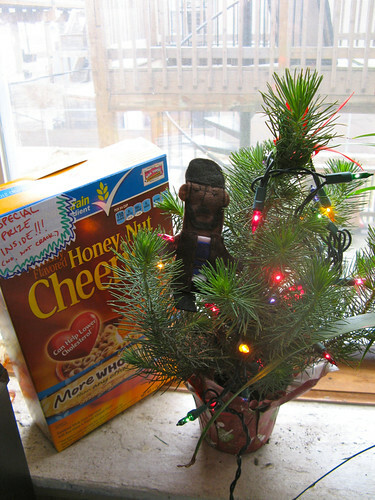 My small Christmas tree, with the Omar Little finger puppet of holiday ambivalence. It’s Chrismukkah (insert your “We’re halfway out of the dark” holiday of choice here), the time of year where some of us take a few days off, eat and drink things with people we love, light sparkly lights, maybe exchange gifts. If this is a relaxing, special time of year for you that you love, I hope you enjoy it. For some of us this time of year is one long slow-motion anxiety attack. I must have “arrived” as an advice columnist in some way, as the letters about family holiday worry, financial stress, grief for dying relatives, the fear of facing abusers over Roast Beast started coming over a month ago. There are too many of them (and some of them cut too close to home) for me to answer in the way they deserve. 1. Travel: You don’t have to go home (if you can’t afford it, if you dread it, if people will be mean to you). Perhaps you will “ruin” someone’s holiday if you don’t go. Perhaps you will “ruin” your own holiday if you do. If you choose to go, it gives you a little bit of armor for you to choose to enjoy what there is to be enjoyed and let the rest go. If you go because you “have to,” you’re sunk. 2. Presents: If you can afford to give presents and you want to give them, presents are delightful! If you can’t, don’t put yourself in a bad financial situation because you think you are “have to” give them. At this point some commenter is going to tell us about the awesome inexpensive Blah blah homemade blah blah crafty! blah blah thing they made, to which I say “Great! Please go share that on one of the 8 million sites about cool crafty stuff that is not here.” For some people making crafty stuff is fun and relaxing and exciting. For someone with limited resources (be it time, emotional energy, or money), the prospect of bedazzling a bunch of whatchamajiggits is filled with pressure and dread. For the record, if someone gives you a present and you don’t have anything for them (because you can’t or because you didn’t know that y’all were gift-exchange-type-people), the correct answer is “Thank you! I love it!” and not a 15 minute Socially Awkward Penguin dance where you apologize for not having anything for them. Send them a nice thank you note. If they are the kind of person who keeps score and gets offended, this experience will teach them not to get you anything next time. Every kiss does NOT begin a diamond pendant shaped like buttocks. 3. Manners & boundaries. Some families think that “We’re close, we don’t need to have manners! We can just say whatever pops into our heads! I’m not criticizing you, I’m just being honest! We don’t stand on formality around here! Wait, why are you crying? God, why do you always have to be so sensitive?” The Venn Diagram of these families and those of the letter writers filling up my inbox are a series of concentric circles. Manners count. Kindness counts. Simone at The Hairpin says the rest. I owe her some kind of nog or amateur craft project for knocking so many letters off of my to-answer list with one blow.